The Minelab SDC2300 metal detector is dynamite on the small gold but you might need to boost the sound of the detector a bit if you are hard of hearing. The minelab SDC2300 metal detector is a reasonably economical machine that is an essential tool in your armoury to find gold, particularly small gold nuggets close to the coil and small specimen gold that other machines might not have heard. Set the Sensitivity to 2. Do a Quick Ground Balance. 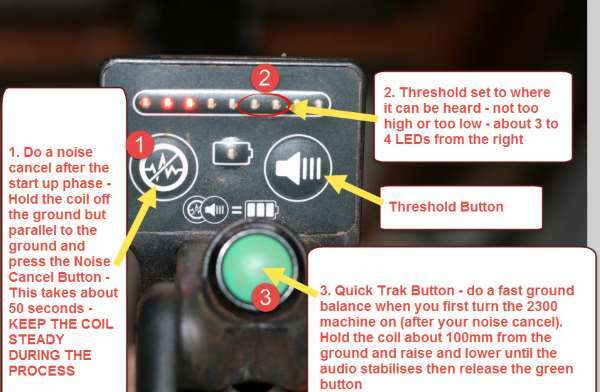 The First step is to set the Minelab 2300 Sensitivity and turn the Machine on. Then do a Noise Cancel and Quick Ground Balance on the Minelab 2300. Thats it!. 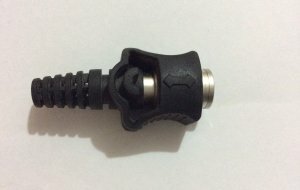 Badly Designed Connector for the Headphones. 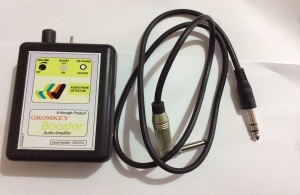 Its a 6 Pin Connector. Its a 6 Pin Connector but Curiously there is only 2 leads Connected. The Booster provided by Frank Horvath 08 92725989. 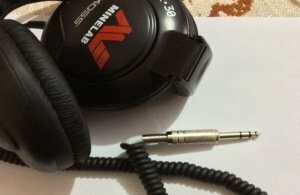 I have discussed earlier the problems of hearing the Minelab SDC2300 machine without some form of booster or Headphones connected (see the video earlier on the page). The major problem is that the connector to the SDC2300 is very fragile and breaks easily - in some case I have heard of it breaking at the first use - Great if you are unaware of this design fault and out the bush. 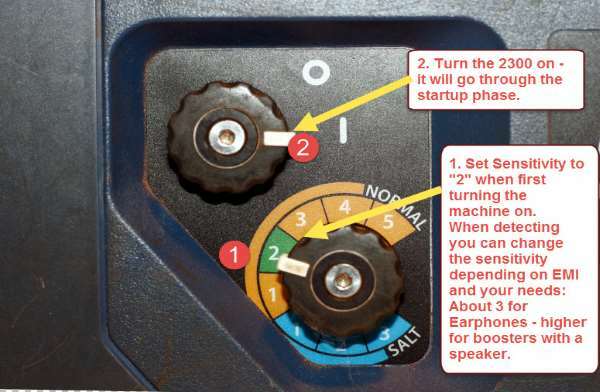 The other design fault is the headphone lead is too short for average sized people so unless you have taped your lead to the machine it is inevitable that you will get tangled up with the Headphone lead and damage the poorly designed Connector in the 2300. The connection is waterproof but the machine comes with non waterproof earphones. So why isn't there a standard 1/4 inch female socket provided in the machine for aftermarket boosters and speakers. 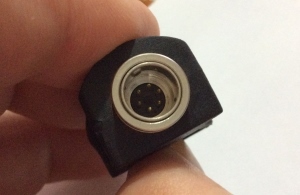 Also Guess what, the female connector piece is unavailable anywhere to get after market fixes done with the exception of Phase Technical as far as I know - and the cost is a massive $110 for a short lead with connector and a sensible socket that a standard Booster or Speaker jack can be connected to. One fix we use it to get Frank Horvath to cannibalise the Headphones that come with the 2300 detector by cutting them putting a 1/4 female connector to the connection end of the 2300 and a 1/4inch jack to the Earphones end of the lead. This can then be used with after market speakers and boosters. At about HALF THE PRICE of the Phase Technical lead, so contact Frank Horvath if you live in WA and want this done he lives at 1a Slade St Bayswater WA and his Phone number is 08 92725989. He also repairs damaged lead or builds lead of any size if you require it. 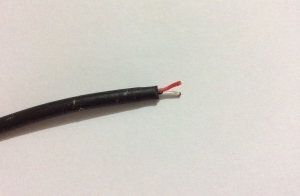 BE WARNED - if you do not securely lock your Earphone lead down with tape or some other method you WILL damage the connection to the lead eventually. Batteries in the Battery compartment loosen and the machine turns itself off and goes through the startup process again (and again!). This will drive you insane if you don't know what is causing the noises when you first buy the machine. Some people have fixed this by using a business card wrapped around the batteries in the battery compartment, that stops the batteries from moving and breaking the connection...yeah right, not a very sophisticated solution. 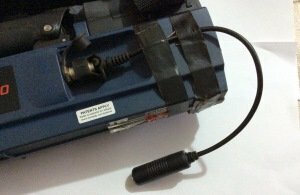 Frank Horvath in WA has a fix to this by providing an insert to the battery compartment of the 2300 with two rechargeable batteries that overcome this vexing issue. 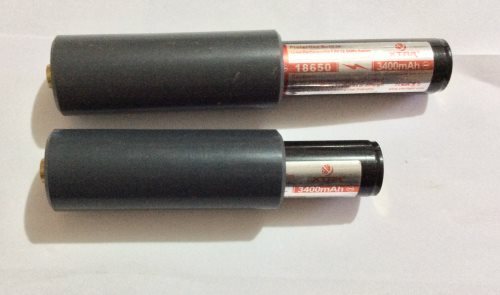 Not only does it fix the problem but the batteries have a greater capacity and voltage that will give you the edge in power while you are detecting. You should have a spare set of batteries anyway so pick up a set of Frank's batteries and use you current ones as spares. Minelab SDC2300 Metal Detector Loose Battery problem fix. We love this machine because it is generating plenty of small gold at our regular detecting spots and apart from the design faults mentioned reckon it is an easy to use, great starter machine that will find your gold, or a detector that you can add to your suite of gold finding tools that will pay for itself. You will need a PDF reader to read the Minelab SDC2300 Metal Detector User Manual PDF. If you cannot open the downloaded PDF files then you can download Adobe Reader by left clicking on the icon below.